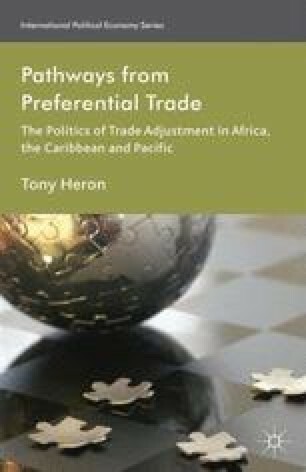 The publication of this book comes hard on the heels of the tenth anniversary of two separate global initiatives, each of which offered an ambitious prospectus for redefining trade and development cooperation between rich and poor countries that has since foundered. The first of these is the WTO Doha Development Agenda (DDA). As is well known, the DDA was launched in the aftermath of the terrorists attacks of 11 September 2001 — and two years after the acrimonious failure of the 1999 Seattle ministerial, when mass civic mobilization and violent street demonstrations came to symbolize the discord between developed and developing countries regarding the content and indeed the overall desirability of a new round of trade liberalization. The unique sense of global solidarity generated by 9/11 provided the necessary impetus to kick-start global trade talks, but policy makers also used the opportunity to recalibrate the tone and objectives of the round to address developing country grievances expressed during the Seattle debacle. In the ten years or so since then, however, the WTO has demonstrably failed to translate these aims into a concrete package of development measures capable of satisfying the institution’s disparate membership. In July 2011, the WTO Director General Pascal Lamy declared that, ‘what we are seeing today is the paralysis in the negotiating function of the WTO… What we are facing is the inability of the WTO to adapt and adjust to emerging global trade priorities’ (ICTSD 2011). As the 21st century dawns, relations between the EU and the ACP countries should be put on a new footing to take account not only of changed political and economic conditions for development but also of changed attitudes in Europe. The colonial and post-colonial periods are behind us and a more politically open international environment enables us to lay down the responsibilities of each partner less ambiguously. We reaffirm that provisions for special and differential treatment are an integral part of the WTO Agreements. We note the concerns expressed regarding their operation in addressing specific constraints faced by developing countries, particularly least-developed countries. … We therefore agree that all special and differential treatment provisions shall be reviewed with a view to strengthening them and making them more precise, effective and operational. Doha Ministerial Declaration, December 2001.